Hi everyone! Jess had an awesome day yesterday. 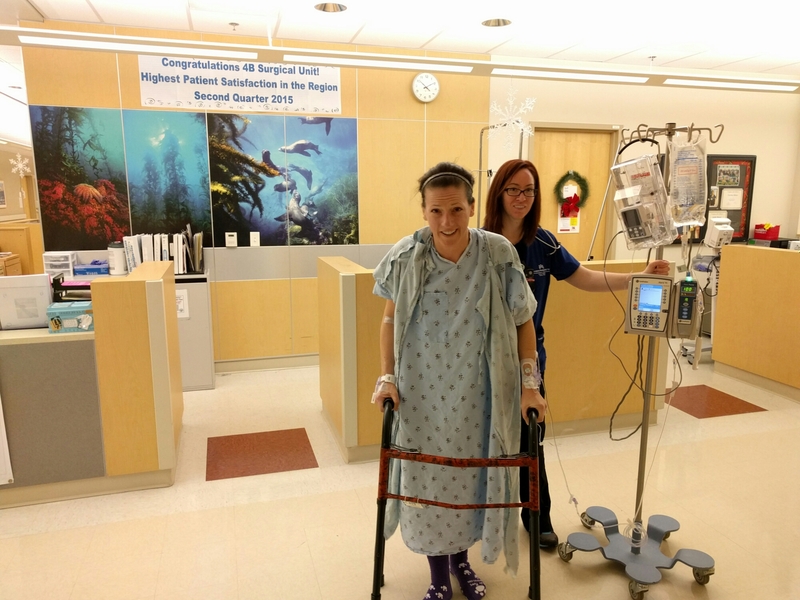 She was able to get out of bed four times and even made a lap of the area outside her room by the end of the day. She started with a walker and only went about 30 feet, and ended with an unassisted full lap! Strong! She is using a breathing device to help expand her lungs, however she has developed an atelectasis which is causing a fever this morning, so visitation will be very limited. Please text me if you plan to come by and I will confirm with Jess and the nurses if she is up for it. The first walk needed a walker, but that was the only one. Great news about the walking. Hope the lung gets happier soon. Love and hugs. Just text me first if you want to swing by. I’ll let you know if she is up for it. Don’t be intimidated by nurses or doctors tell them to sanitize hands before they touch Jessica. They tend to be so lax at the hospitals. I’ve been watching. This staff is very disciplined. The Landrum’s send our famous hugs! Great start to the recovery process! Bummer about the fever. Jessica is a strong willed gal, she’ll do just fine! Never had a doubt!